West Ham boss Sam Allardyce says the collapse of Emmanuel Adebayor's loan deal was "frustrating". The Tottenham forward's move was blocked by Spurs chairman Daniel Levy. 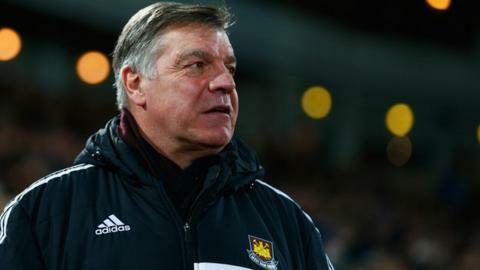 Allardyce said: "A lot of moves were blocked for various reasons so I'm not that bothered. From our point of view it left us a bit frustrated. "It didn't look like we were going to be active until the very end, but then we picked up five injuries and now we are very short." West Ham face Manchester United at home on Sunday (kick-off 16:15 GMT). "It's particularly worrying at the moment, I've had to bring a list of the injuries with me. James Collins, Winston Reid, Guy Demel, Diego Poyet, Doneil Henry and Andy Carroll lie in our medical room at the moment. "We're not sure how many of those will make it for Sunday. With such a big week coming, three games in a week, there'll be very few risks taken, unless they're 100% fit. If we play them it may exacerbate the injuries so we will go to battle with what we've got." "Maybe, we'll have to wait and see." The Hammers were fined £71,000 by Fifa following Senegalese striker Sakho's match-winning appearance against Bristol City in the FA Cup, despite missing the African Cup of Nations with a back injury. "We went all out for a defender in the window after the Liverpool game. However, it didn't work out, we were only in a position to get someone in on a loan but we couldn't pull it off. "Everyone that wanted to come, wanted a permanent deal, which we couldn't do at that time, so that's the position we're in. Someone will have to fill in at the back and maybe stay there for a while." "We certainly took some positives from the game as we almost came away with a result. Had it not been for a poor decision to rule out Kevin Nolan's equaliser we would have done. That would have been a great boost for us at the time. "On Sunday, it's about us keeping a clean sheet, the longer we do that the more we will frustrate them and the better chance we have of winning."